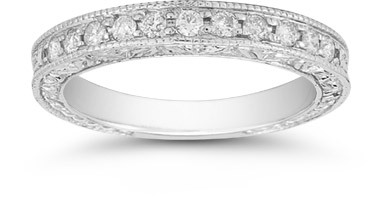 The perfect vintage, 14K White Gold Victorian-style wedding band to match one of our best selling engagement rings, including our vintage style engagement ring. This ring will also fit with the QDR-4. We guarantee our Floret Diamond Wedding Band to be high quality, authentic jewelry, as described above.